The SEO Tool Box: Which Tools are the Most Valuable? Do you ever wonder which tools are at an SEO specialists fingertips? As SEO experts, the resources and tools that we use to analyze website’s analytics, viable keywords, and conversions are an integral part of our everyday routine. Just as a master carpenter’s tool box is with filled with only high-quality tools, each serving a different purpose, an SEO is similarly equipped with a plethora of useful applications which make their job possible. Just like tools used for building, there is an abundance of options and styles available the market, and it’s important to choose only the best in order to avoid having unnecessary weight in the tool box. In the internet marketing industry, there are a lot of free and paid tools for SEO, some superfluous and others invaluable. Today we’ll share which tools are must-haves for improving SEO, increasing organic traffic and boosting conversions. 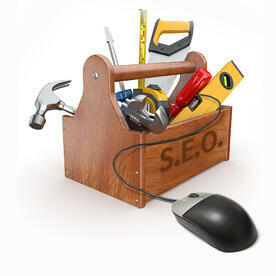 Google’s suite of tools is the first requirement for any SEO’s toolbox. Like the carpenter's hammer, this suite serves multiple purposes and pays for itself time after time. Google Analytics, Google Search Console, Google AdWords Keyword Planner, and Google PageSpeed Insights are necessities for any website, whether you are managing the online marketing campaign or simply a business owner checking your own metrics. Let’s start with Google Analytics. This product gives you some of the most inciteful data you’re ever going to get about your website’s traffic sources and it’s visitors. If you are not already using this to optimize and track your site, we recommend that you get it set-up ASAP. Google Analytics gives you valuable user behavior information including how they got there (i.e. referral, organic, or social), from where (i.e. geographical location), and when (i.e. time of day, day, month, year). It conveniently also tracks which pages they enter and exit from. Analytics allows you to uncover some of your biggest opportunities by identifying the best and worst aspects of your site’s pages. While all of this information may sound a bit overwhelming to sort through, Google makes this tool extremely intuitive for beginners, and they offer excellent support. Next on the list is Google Search Console. You may be thinking, “What is Google Search Console? I’ve never heard of that!”. On May 20, 2015, Google Webmaster Tools was rebranded as Google Search Console. While this product just got a new name, it has always been highly valuable in understanding SEO. It allows you to diagnose a wide range of issues that may be occurring on your site as well as report the actions you have taken to correct issues directly to Google. Like Analytics, this is a must for any website manager! If you have a Google Adwords account, you can access the Keyword Planner. The Keyword Planner offers valuable data for choosing and researching keywords, so it’s worth setting up an account even if you are not planning on doing pay-per-click advertising (see our post about how to choose viable keywords for your business or brand). This tool provides related terms, search trends, competitiveness of costs, and search volume for your keyword seed list, keeping you abreast of how users are searching for your products or services. Finally, PageSpeed Insights is a simple tool that measures your site’s desktop and mobile web page performance and offers, well, insights, on how to resolve potential issues. As you can see, Google’s free tools are effective at driving the essential analytics home, while providing you with an opportunity to create a dynamite marketing strategy. While SEMRush is a paid SEO tool, it’s valuable if your industry or brand is in a very competitive market. Like the carpenter’s level, it will help you get a precise reading on how you want to structure your competitive strategy. SEMRush offers a comprehensive range of competitive analysis for both paid and organic traffic. It’s awesome because you can see data from your own website and compare it to your competitors. With all this information, you can then analyze and compare keyword rankings, traffic patterns, backlink sources, and more. For less than $150 per month, you can research competitors, their data, and advertising spend. Pretty cool, huh? While Screaming Frog sounds really scary, it's not. This spidering tool is another essential that happens to be free to download. It’s like a blueprint of all your website’s pages. Crawling your site with this tool allows you to access an incredible amount of data; therefore, will allow you to perform a technical website audit. It provides all of the site’s URLs, server errors, meta descriptions, title tags, duplicate content, and much more. You can even customize the crawl, so if your site is really large, you can examine particular sections at a time. Another free download, Xenu’s Link Sleuth is a program that checks a site for broken hyperlinks, images, plugins, maps, style sheets, etc. This amazingly accurate tool, is great after a website launch or even just a random check in. Crazy Egg is like the carpenter’s multifaceted utility knife allowing you to trim the corners of a finished piece. Crazy Egg is a (colorful!) heat mapping tool that demonstrates how visitors engage with your website. From there, you can get a better understanding of what works, and what aspects of your site are making people leave. You can trim away what is not working: maybe a void space, no call to action, or poor navigation, and in turn get insights on how to increase your ROI. Page One recently became a Hubspot partner, and every day that we use Hubspot we find aspects that we rely on more and more. Hubspot, which is a paid software, offers a comprehensive Keyword Ranking Tool that allows you to research keywords, discover how your competitors rank, get SEO tips for each of your website pages, and then watch keyword rankings along with website traffic grow over time. We use other keyword ranking tools as well, but we find that this one is worth mentioning. This is a brief overview of some of the most valuable tools our team uses every day. As I mentioned before, there are hundreds of SEO tips and tools to choose from, and in the end, you will have to decide which one are worth your time, give you the best ROI, and provide the best insights into how you can increase your organic traffic.